Chicago has so much to offer families any time of the year, but the holiday season holds a special charm for this winter wonderland, as snow and cheer cover the city in equal parts. McCormick Tribune Ice Skating Rink in Millennium Park (November 14, 2014 – March 7, 2015): Enjoy free family ice skating daily (weather permitting) on a beautiful rink situated right in Millennium Park! Gaze up at Chicago’s iconic Cloud Gate and enjoy a winter experience that is free to all, all winter long. Skate rentals are available if you are travelling from out of town or otherwise do not bring your own skates (There is a cost for skate rental). Also, you and your children can participate in a holiday sing-along, joining the beautiful voices of different Chicago choral groups for carolling under Cloud Gate daily from November 28th – December 19th. Christkindlmarket in Daley Plaza (November 21 – December 24, 2014): This quintessential Chicago holiday and Christmas fixture transforms Daley Plaza into the quaint Main Market Square of Nuremberg, Germany. The Chicago version is full of life and wonder, in the form of stalls selling gifts, food and festive fun. 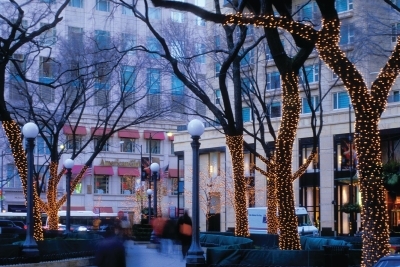 More than two million people every year come to enjoy the holiday spirit, right in the Loop. Savor Chicago’s unique international communities with Christkindlmarket, now in its 19th season! ZooLights at the Lincoln Park Zoo (November 28, 2014 – January 4, 2015): ZooLights is a wonderful, family-friendly holiday celebration that transforms Lincoln Park Zoo into a festive spectacle. Experience a sky illuminated by more than two million lights, including larger-than-life animal and seasonal displays. There are also holiday crafts, activities and treats for children. Santa Claus will be accepting visitors at the Helen Brach Primate House as well. Take a ride on the new Lionel Train Adventure, or go Ice Skating alongside animals under the magical holiday lights for an unforgettable experience. New Year’s Eve Fireworks at Navy Pier (December 31, 2014): New Year’s Eve celebrations at this Chicago staple include TWO fireworks displays – the traditional fireworks display at midnight ,as well as a family display at 7 PM. This is a wonderful option that allows you to enjoy the festivities together while not letting the kids ruin their schedule for the rest of your trip. Chicago Chinese New Year (February 19 – March 5, 2015): Chinese New Year 2015 will be celebrated across Chicago with events spanning two weeks. There is a kickoff event on February 19 at the Chicago Cultural Center presented by the Chinese Fine Arts Society, plus a Chinese New Year Parade on February 22, and a Lantern Festival on March 1st at Navy Pier. Chicago has an impressive Chinatown area (second-largest in the US) and the city anticipates hosting visitors from around the country as well as from China. Throughout the celebration expect cultural performances and demonstrations, amazing food and even special hotel, retail and restaurant promotions across the area. The good folks at ChooseChicago.com offered their expertise to help point out these stellar opportunties for families. For more information on any of these activities, as well as other fun seasonal and year round activities, be sure to check out their site.